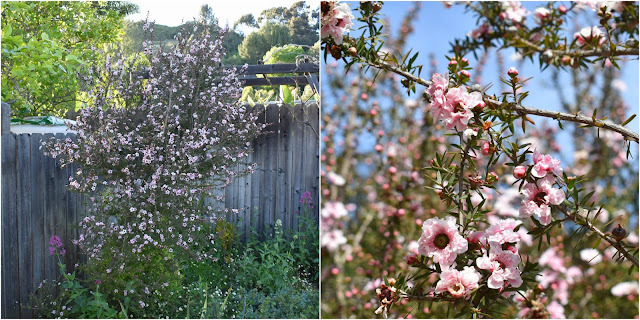 With cooler than normal temperatures and heavier than usual rain through our winter months, I'd expected a bountiful Spring but I think even I was unprepared for the sheer volume of blooms in my garden this April. 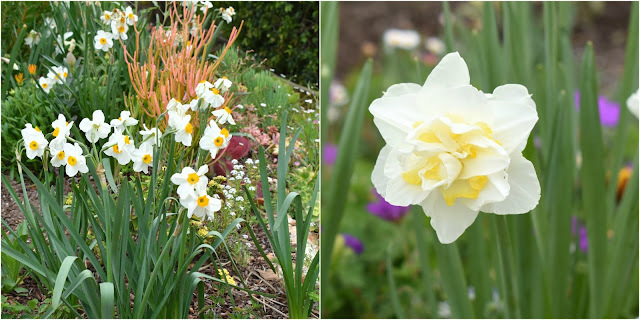 As two of my favorite memes, "In a Vase on Monday" and "Garden Bloggers' Bloom Day," coincide again this month, I'm combining them in a single post. I'll start with abbreviated coverage of the vases I prepared this week, followed by a lengthy Bloom Day segment. I made up two vases again this week, taking advantage of some of the flowers most likely to die off quickly as our daytime temperatures continue to rise. 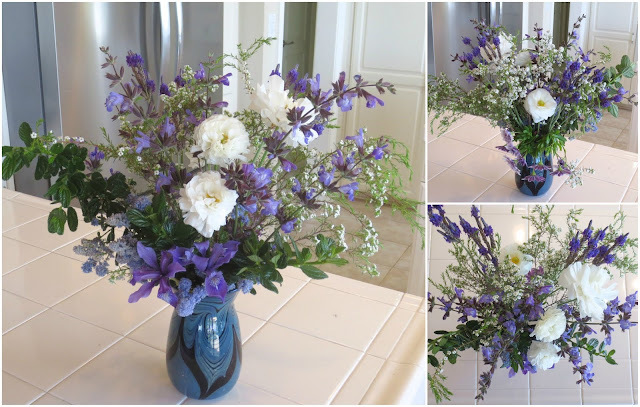 For more Monday vases, visit our IAVOM host, Cathy at Rambling in the Garden. A simple blue and white scheme shown from the front, back and top. 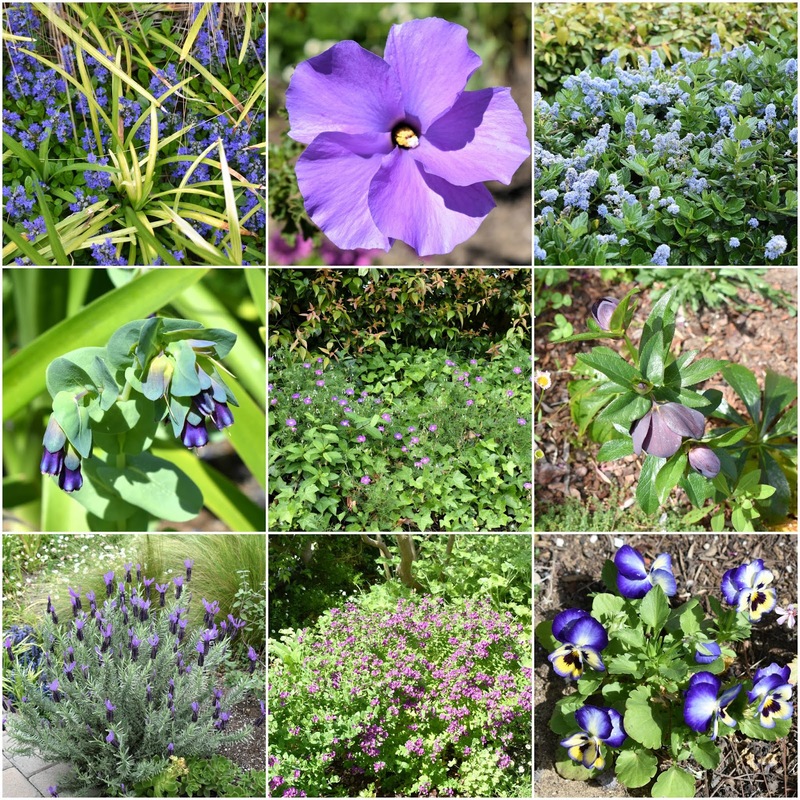 I included noID Ceanothus, Coleonema album, Iris douglasiana 'Santa Lucia', Osteospermum '4D Silver', white Ranunculus, and Salvia heldreichiana. 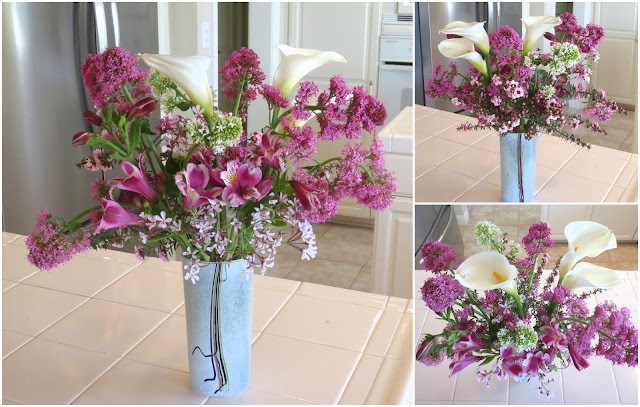 This pink and white arrangement is shown from the same 3 angles. 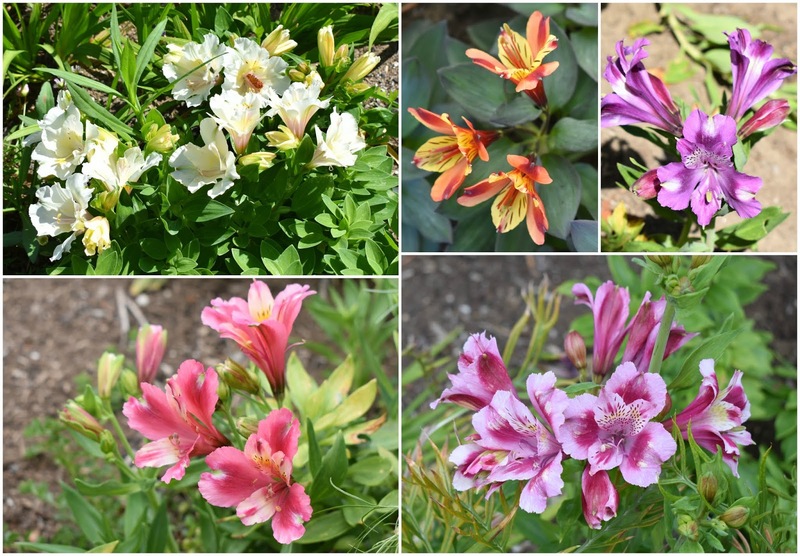 It contains: noID pink Alstroemeria, Centranthus ruber (pink and white forms), Leptospermum scoparium 'Pink Pearl', Pelargonium 'White Lady', and Zantedeschia aethiopica. I took a LOT of photos for Bloom Day this month. Believe it or not, what follows was trimmed down considerably. I'll keep my comments to a minimum so as not to try your patience too much. 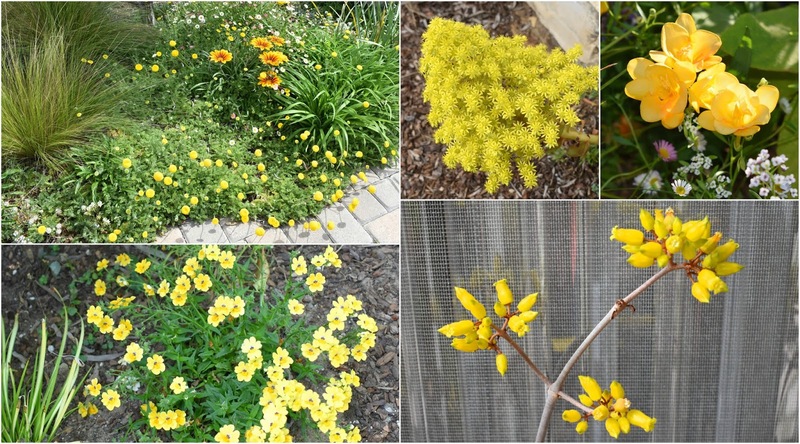 Let's start with the splashiest blooms gracing my garden at present, listed in alphabetical order as it's nearly impossible for me to pick favorites. I wasn't going to admit to a favorite but I'm honestly in love with this plant. It's Leucospermum 'Brandi', blooming in earnest for the first time this year. 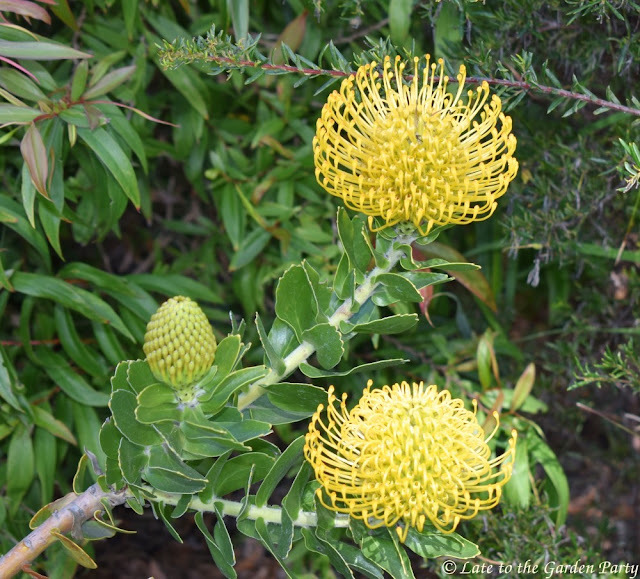 Leucospermum are also known as Pincushion Proteas. 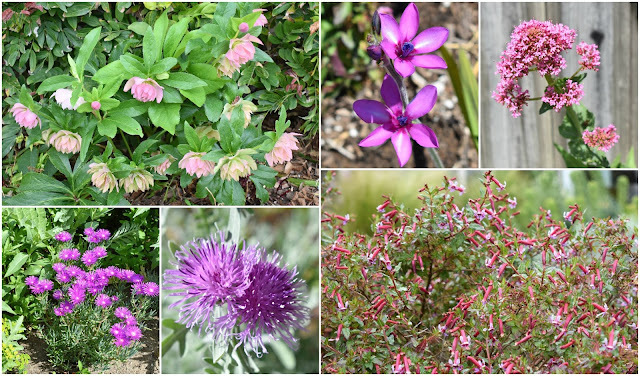 Several genera of plants are putting on an especially good show right now when looked at as a collection. I've got IDs on only 2 of my Alstroemerias. The white one on the upper left is 'Claire' and the red-orange one next to it is 'Indian Summer'. Eschschlozia californica, California's state flower, bloomed on my back slope this year after hardly any blooms last year. 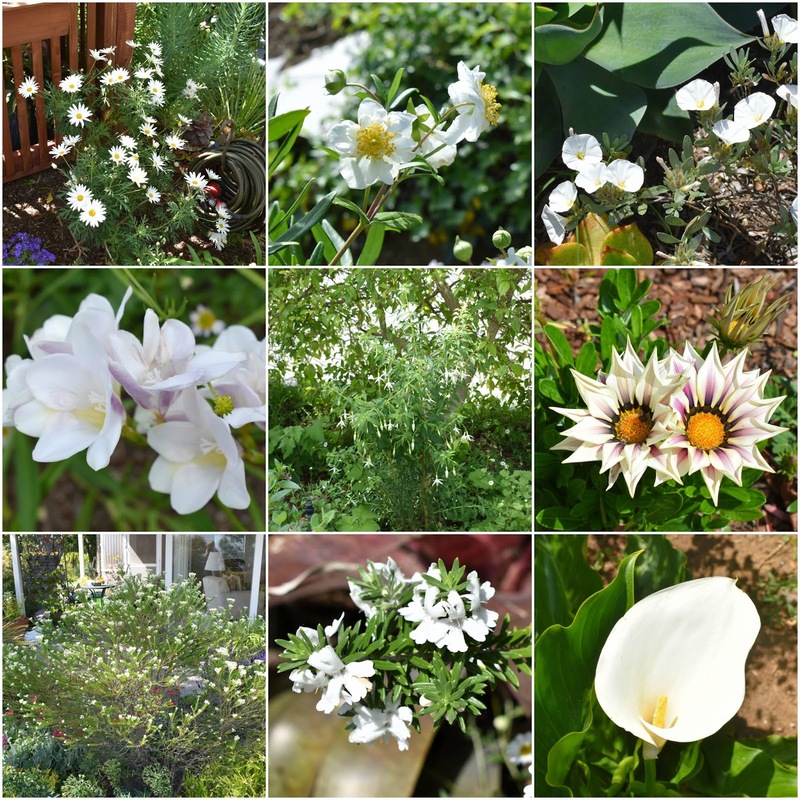 The variety in the middle, 'White Linen' was planted from seeds years ago but the others are mostly products of plugs I planted this past winter. 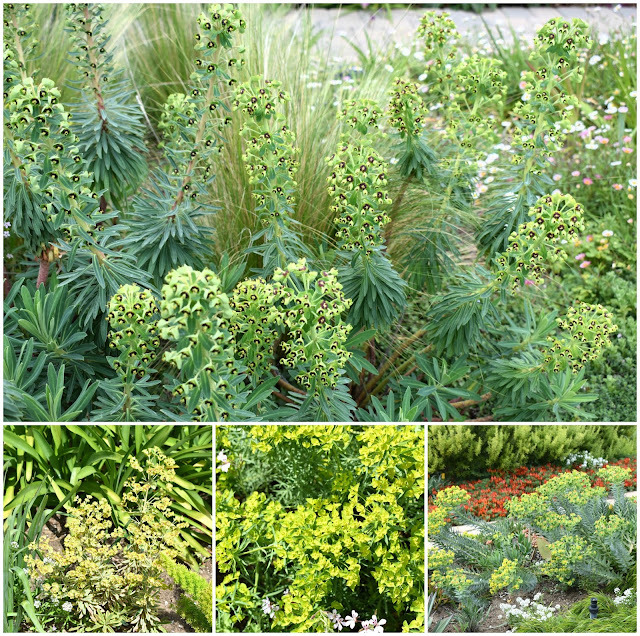 I've no problem growing Euphorbia. Clockwise from the top are: E. characias 'Black Pearl', E. rigida, 'Dean's Hybrid', and 'Ascot Rainbow'. The Osteospermums aren't liking our warmer temperatures either. Clockwise from the upper left: O. '3D Purple', '4D Silver', '4D Violet Ice', 'Summertime Sweet Kardinal', 'Berry White' and 'Double Moonglow'. In contrast, the Pelargoniums like warm conditions. 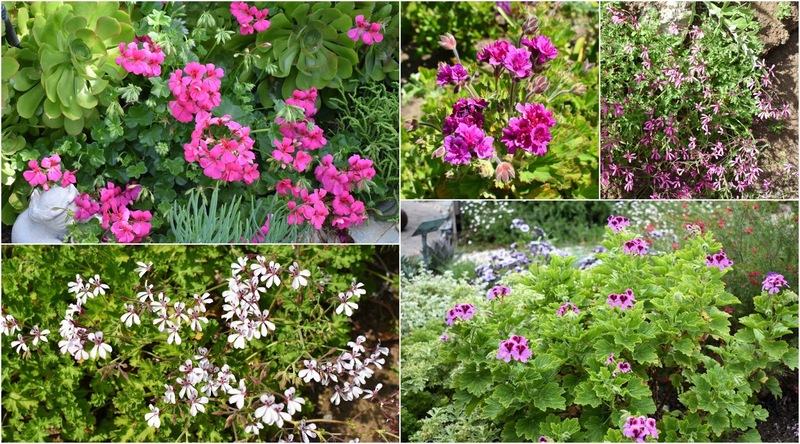 Clockwise from the upper left: Pelargonium peltatum 'Pink Blizzard', P. cucculatum 'Flore Pleno', P. 'Pink Fairy Cascade', P. 'Orange Fizz' (the name comes from the scent of the leaves rather than the color of the flowers), and P. 'White Lady'. 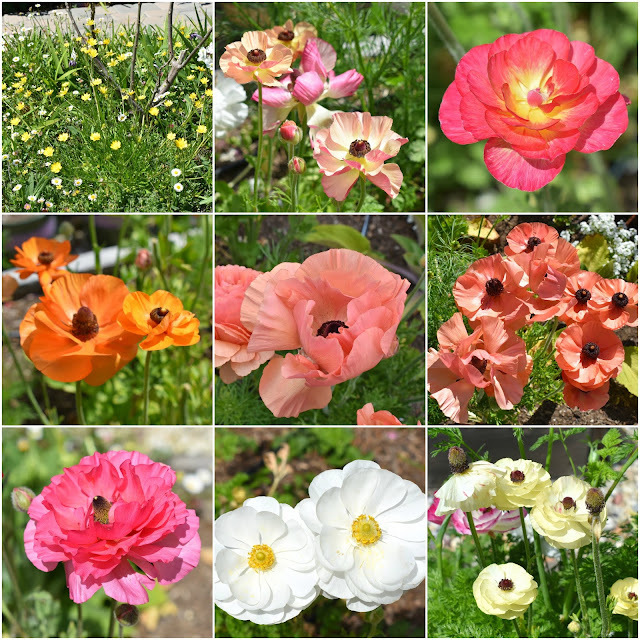 With the exception of the perennial Ranunculus californicus on the upper left, all these are R. asiaticus grown from tubers. The latter haven't held up to our recent warm, dry winds. 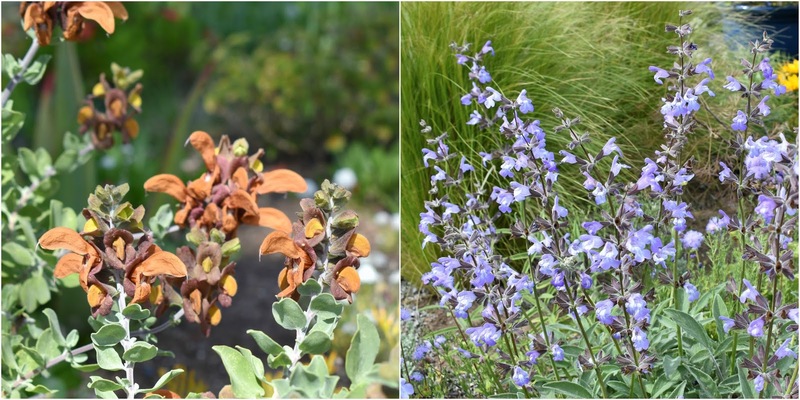 Two other plants distinguished themselves for the oddity of their blooms rather than the size or sheer number of their flowers. 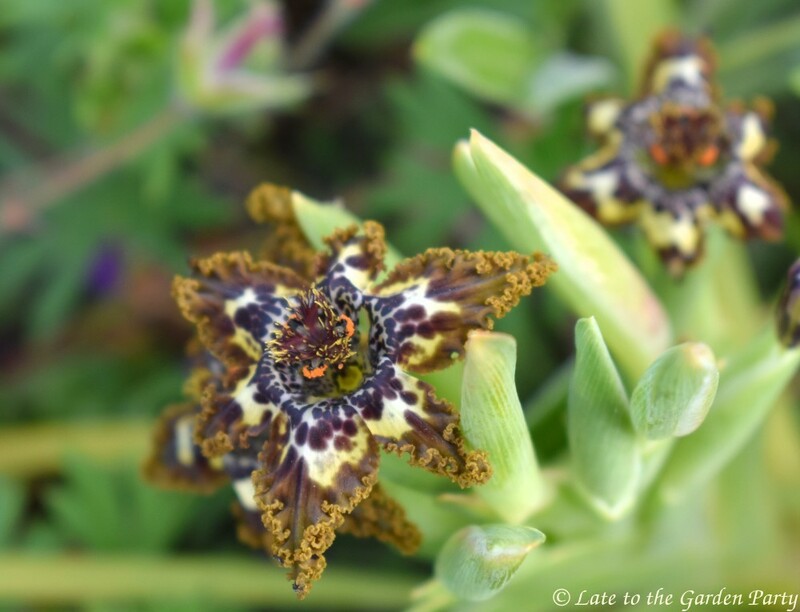 This photo of Ferraria crispa (aka Starfish Iris) was taken early this month. The flowers came on in a flurry this year but seem to be done now. I'll close as usual with collages made up of the best of the rest of the blooms in my garden. You made it to the end! For more Bloom Day posts, visit our GBBD host, Carol at May Dreams Gardens. Talk about abundance! Breathtaking gloriousness! What a festival! A display like this makes it much easier to bear the long summer to come. I could look at the picture featuring the hot red Lotus berlothii all day. The sweep of low grey-green foliage is the perfect complement in color and scale, and both are enlivened by the creamy white of the stepping stones and the spray of blooms at the curve. Just a fantastic composition. 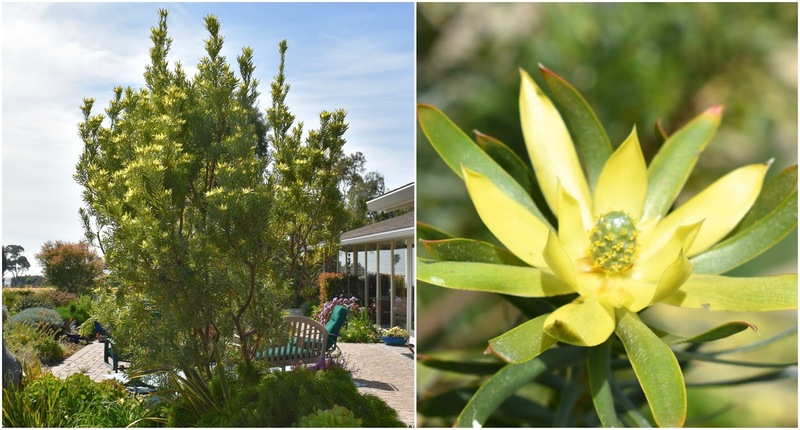 Your shots of the spectacular, otherworldly Leucospermum blooms make clear the urgent need for a YouTube channel dedicated to time-lapse videos of them, from start to finish. 'Brandi' is an exciting addition, but they're all fabulous. Thanks for this scroll-fest of delights. Actually, Nell, the Leucadendron does have a tendency to develop a lop-sided shape...I keep trying to prune it into submission. 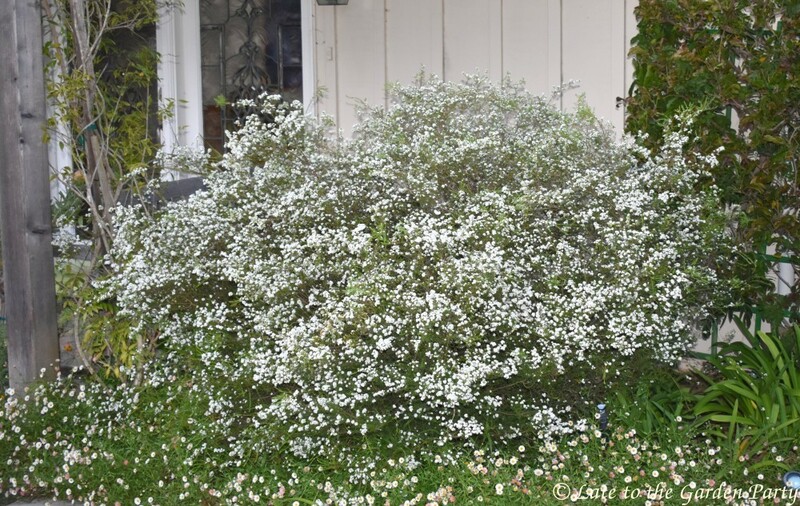 As to the Leucospermums, 'Spider' is relatively quick about its shape-shifting but 'Brandi' morphs VERY slowly. Hah! Making it to the end of your spectacular cavalcade of blooms on Bloom Day is never a chore, it's a wonderful treat, although I think you fear it may be one. I'm so thrilled you folks in California got so much lovely rain this winter and early spring. I especially enjoyed that shot of the Lotus on both sides of your path and all the pictures of Leucospermums and Grevilleas. The Lotus is now trying to cover the flagstone path from both sides, Alison, and it's not subtle about it. I swear grows by inches overnight. Your garden is fantastic, Kris. I am always so impressed with the things you can grow. And jealous too. As Alison said, the Leucospemums and Grevilleas! Just lovely! I'm in love with my Leucospermums, Grace. After years of killing the small seedlings I kept picking up at plant sales, I've finally turned the corner and got blooming plants. You have an astounding variety in your garden, Kris. It must be a riot of color right now. 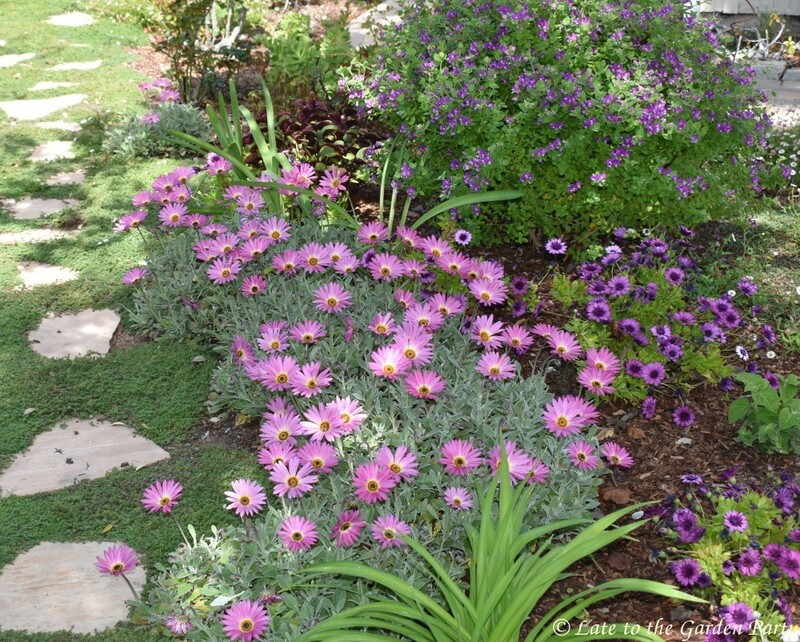 I like the combination that includes Arctotis 'Pink Sugar,' Gazanias and two Lotus. You wouldn't think the colors would work, but they really look great together. 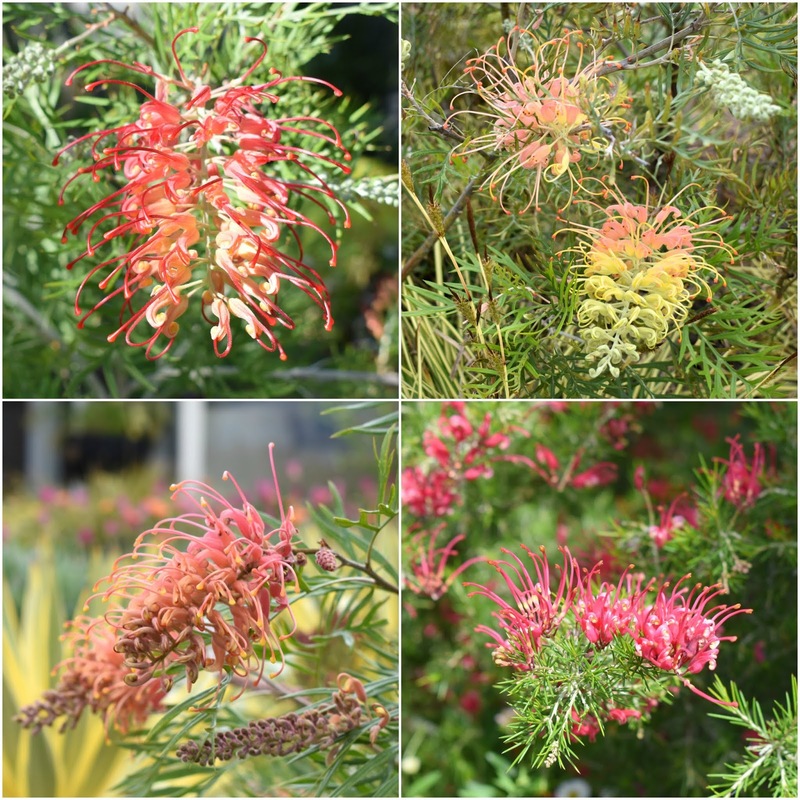 Love the Grevilleas, too. And as always, your arrangements look beautiful. The white and blue/purples are soothing and the pinks are cheering. Have a great week ahead! It IS a bit of a riot at the moment, Eliza. In my minds'eye, I'd envisioned a somewhat slower, more restrained unfolding of the colors in my garden. Delicious colors on your arrangements once again. There was a 10 gallon 'Brandi' Leucospermum for sale yesterday at Green Thumb, and Wowza! No wonder you love it. I was sorely tempted but since it was $150 it stayed at Green Thumb. Do you recommend Ageratum corymbosum? What do you think of it? I've been eyeing lately it on the Annie's site. 'Brandi' was worth the wait, HB. I'd feared she'd never bloom but she's come through this year and, if the grower's specs are right, she's still got a couple of feet to grow. Re Ageratum corymbosum, I love the plant but found it's choosy about where it's sited. The plants in my photo receive morning sun only. When I tried growing another one in a fuller sun position, I lost it. It also has a relatively short (4-6 week) ugly period after it blooms. I routinely cut it back hard then. It looks great when it leafs out again. In my garden it blooms only once a year, not periodically as Annie's spec suggests. Thanks for the A. corymbosum comments. Helpful! Annie has that magic SF bay climate less hot than ours. Well, I am beyond amazed at all this gorgeousness. Just wow! 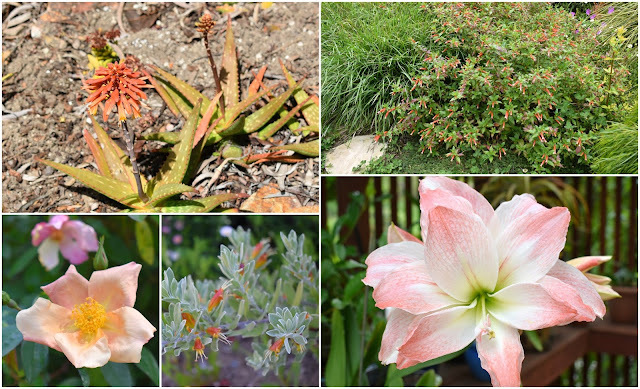 It's simply amazing how many different plants you have blooming right now...many of which I've never seen before. That starfish iris is so unusual! 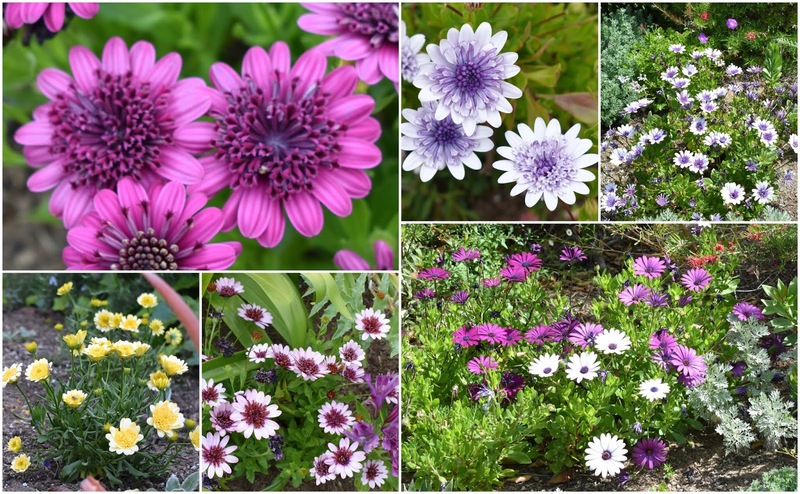 I'm not surprised that I've not heard of many of these, though - as only a small handful are grown here (and usually they are grown as annuals). I'd never seen the Starfish Iris myself until 2 years ago when a photo on-line caught my attention. Since then I've seen it popping up all over, most recently as bulbs in bags at my local garden center and at a cactus and succulent show a week ago. Who knows, Margaret, it may pop up somewhere near you sometime soon too! That pink, orange and yellow growing in front of your window is pure spring! I love that photo too, Diana. The self-seeded Gazanias obliged by blooming in that spot at just the right time. Spring bounty indeed. What a glorious sight your garden must be. I wish I could stroll round and enjoy it in person. You have some amazing blooms. Lovely arrangements too. Thanks Chloris. You're always welcome, should your travels bring you to Southern California. What an amazing number and array of flowers in bloom. I think you have blooming now, more than I have in the whole course of a summer. No wonder your arrangements are always so lovely with so many gorgeous blooms to pick from. Just beautiful Kris! I admit I'm a bona-fide flower freak, Cindy! Wow! 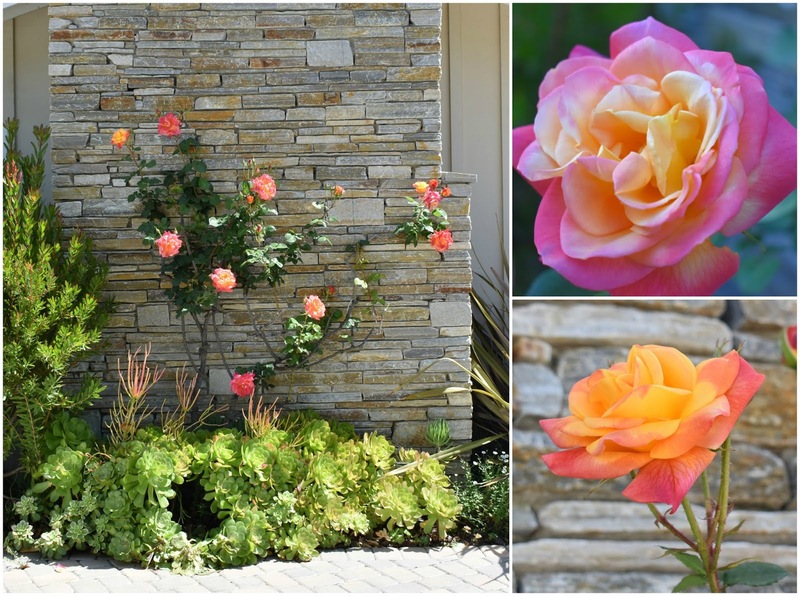 What an amazing variety of blooms! Even I'm amazed this year, Lea! Wow Kris, that is just over the top ! I can't even imagine that much going on in my garden at one time-I wouldn't know where tolook and I would never go inside ! There's a lot going on, that's for sure, Kathy. Late this afternoon I noticed that the first Agapanthus buds are up! My goodness, such fascinating colors! I so enjoyed these lovely blooms with the different textures and colors. So many flowers!!! I still am quite taken with the Ferraria crispa. I bet you could grow the Ferraria with winter protection, Loree. Annie's sells the bulbs and I've seen it pop up elsewhere here and there of late. I can try harvesting seeds for you this year if you'd like but those would require an investment of several years before a bulb forms large enough to produce flowers. Oh my word, this is incredible! You have SO MANY flowers! A lot of them were new to me, so I was learning as I went. Leucospermum are indeed unique and I love them too! 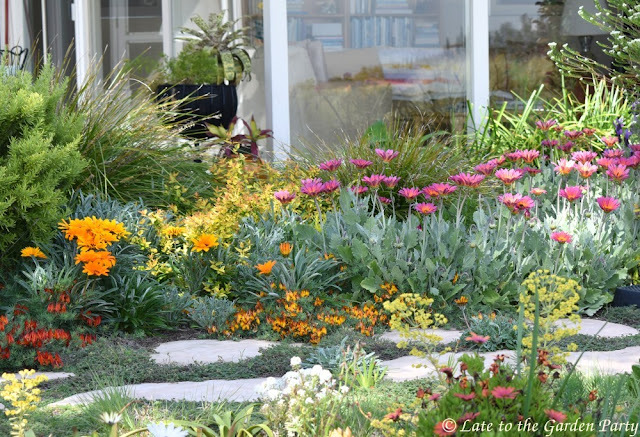 If you have the right climate for them, Leucospermums are worth an investment. They're becoming more common in garden centers in my area and their prices are finally coming down a little. Thanks for visiting! A visit into your garden is alike footsteps into heaven ....got awestruck on the beauty of Leucospermum haven't heard of it before and multiple flower collages are my monthly medication to my soul.You are master of your art to create this much in a neat form at one time in your garden. Such kind words, Arun. I appreciate them. Are you certain about the id on your bupleurum? It looks more like a yellow-flowering nigella to me..which I've never seen before and would love to hear about. You're right! 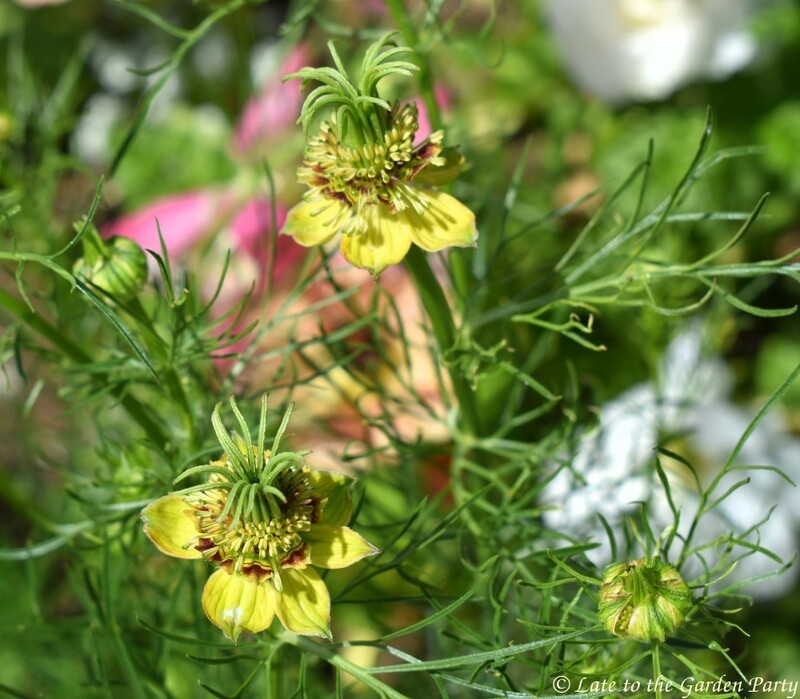 I just checked my record of seeds sown in late October and that list included both the Bupleurum AND Nigella orientalis 'Transformer'. Both were sown in the same raised planter at the same time but I didn't make the connection until I followed up on your question. There's actually no sign of the Bupleurum at this point. Thanks for pointing me in the right direction. Oh my, what a bonanza of blooms. It is all overwhelming. You need to invite everyone you know over to see it. What fun. I wish I wasn't so far away I would be first to the gate. :) Happy GBBD. It IS a little overwhelming at the moment, Lisa. Every time I turn around I find something new blooming or about to bloom. Spring is exciting here this year! Wow. Kris, I appreciate the time and effort it took to take the photos, then prepare and publish this post! 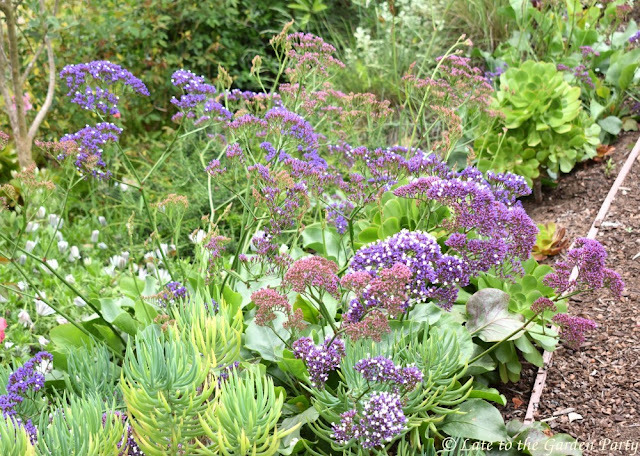 Your garden is a botanical wonder! 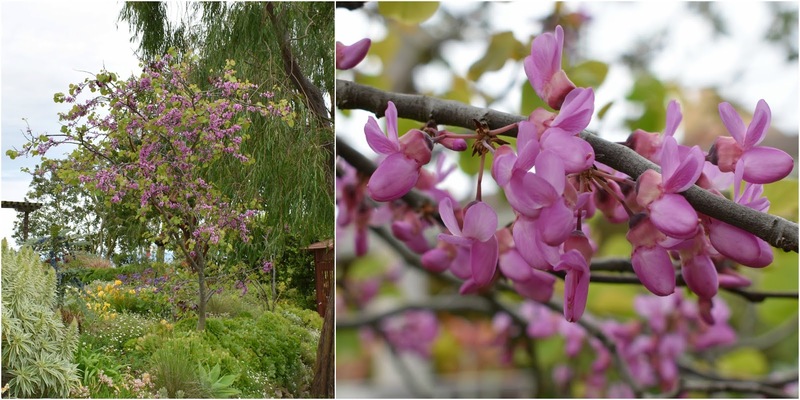 It must give you enormous pleasure to explore and see what is blooming each day. I do wish you would take a long shot of your garden and show us what it all looks like put together. Your Leucospermum are new to me, but their blooms are fascinating. I see why your favorite is among them. Happy spring! I posted my quarterly "wide shots" pots in early April so you may want to take a look at that, Deb, but I'm also planning to provide shots of some of my favorite plant combinations later this week. Kris, your bouquets are wonderful and the interesting blooms in your garden amaze me. I like the Arctotis 'Pink Sugar'. I like everything! Hope you're enjoying each moment in the garden. Spring in the garden is truly wonderful, Susie. I'm hoping for another month of it but I fear that summer plans to accelerate the parade sooner than I'd like.